I am an Associate Professor specializing in Media at Simon Fraser University’s School of Interactive Arts and Technology. 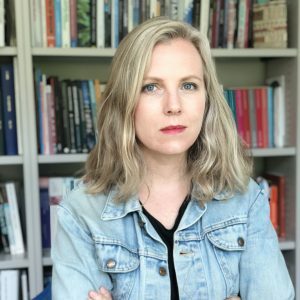 I am an anthropologist with a PhD in Anthropology from the University of British Columbia and an MA in the Anthropology of Media from the University of London, School of Oriental and African Studies. As the director of the Making Culture Lab, my research explores the role of digital technology in the documentation and safeguarding of cultural heritage, and the mediation of culture, history, objects, and subjects in new forms. My video and multimedia works investigate documentary methodologies to address Indigenous and settler histories of place and space. My work has been published in journals such as Leonardo, American Indian Quarterly, Museum Anthropology Review, Visual Anthropology Review, and PUBLIC. I was a Trudeau Foundation Scholar from 2006-2010, a Social Sciences and Humanities Research Council of Canada Graduate Scholar from 2005-2009, a Canadian Polar Commission Scholar in 2006-2007, and a Commonwealth Scholar in 2001-2002. As a member of the Council of Canadian Academies’ Expert Panel on Memory Institutions and the Digital Revolution, I was recently a co-author of the report commissioned by Library and Archives Canada titled Leading in the Digital World: Opportunities for Canada’s Memory Institutions. I am honored to have been recognized for my work and collaborations. In 2008, I was part of a team who received the Society for Visual Anthropology’s Jean Rouch Award for Collaborative Ethnography (for Dane Wajich: Dane-zaa Stories and Songs); in 2015, the Ethnographic Terminalia Collective was awarded the Council for Museum Anthropology’s Michael Ames Award for Innovative Museum Anthropology. In 2017, I was awarded the Confederation of University Faculty Associations of BC’s Early in Career Award, which recognizes the contributions to the non-academic community made by faculty members who are at an early point in their careers. I am a co-founder of the Ethnographic Terminalia Curatorial Collective, which curates exhibitions at the intersection of ethnography and contemporary art each year in parallel with the annual meetings of the American Anthropological Association. I recently served on the boards of directors of the American Anthropological Association’s Society for Visual Anthropology, for the Museum of Vancouver, and Access to Media Education Society. I was recently the co-curator with Vince Dzeikan of MWX2018 Vancouver, the exhibition program of the Museums and the Web Conference. Learn about the courses I teach at SIAT here.